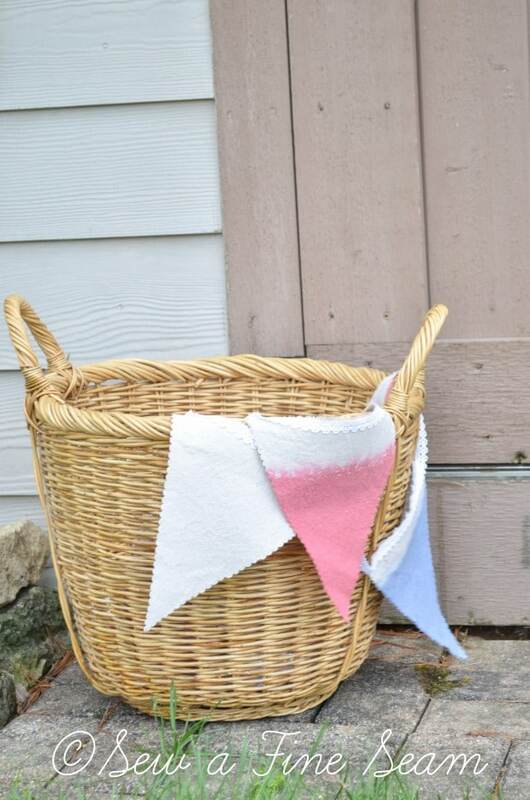 Today I’m sharing another version of the dip-dyed pennant banners. 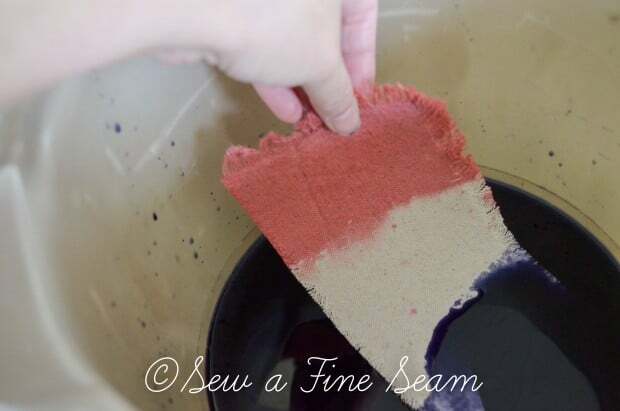 You can see the tutorial for making pinwheel banners in yesterdays post and also the tutorial for dip-dyeing your banners. It doesn’t take long, it’s a fun project, and the banners fold up neat and small and can easily be stored for next year! You can dye your banners any color you want for any season or holiday or birthday or party. 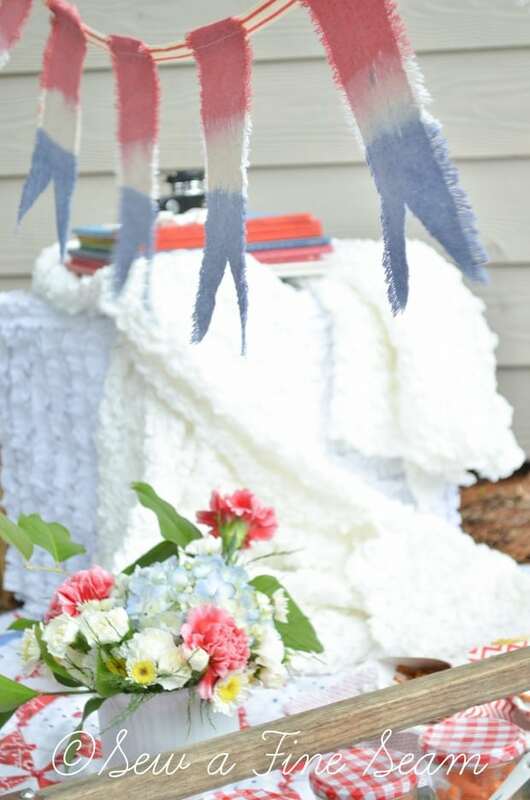 Or you can create these banners without going through the dyeing process if you prefer. Us the same water and dye amounts in the tutorial post or tweak the amounts to suit yourself. 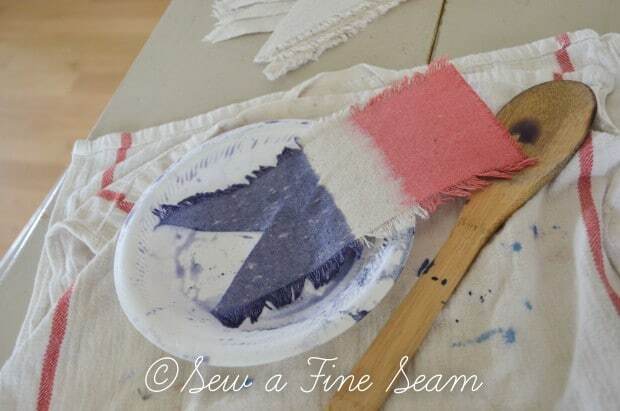 Cut rectangle strips of fabric the size you want for each pennant and fray edges. I cut an upside down ‘V’ in the bottom end of each of my pennants. To create each pennant with red, white and blue stripes I started by dipping the top third of each pennant in the red dye. I let that dry a bit – just so it wasn’t dripping anymore – and then dipped the bottom third of the pennants in the blue dye. As you can see I wasn’t extremely accurate on my thirds – I just eyballed it and called it good. That’s part of the beauty of creating your own decor and projects – anything goes. I also didn’t mind if there were a few splashes of dye on the white part in the middle. Signs of a true DIY. Let them dry. Notice this is inside my house. In the tutorial post I added a tip about NOT doing these in the house. Just trust me – you will be very glad if you do this OUTSIDE. You can also cut triangles for your pennants. 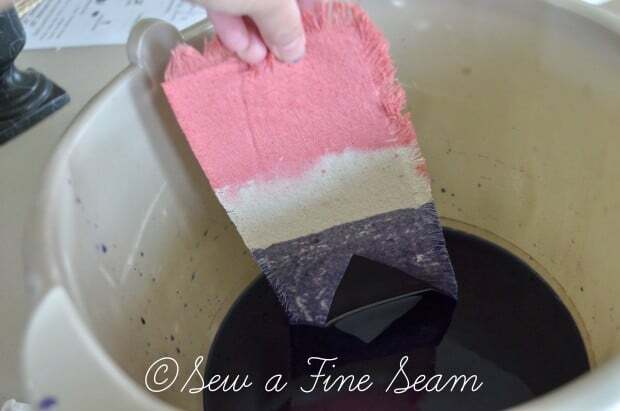 You can dye the whole piece of fabric instead of just part of it. You can can create your banner any way your little heart pleases! It’s your banner so let your spirit run free and create something you love. 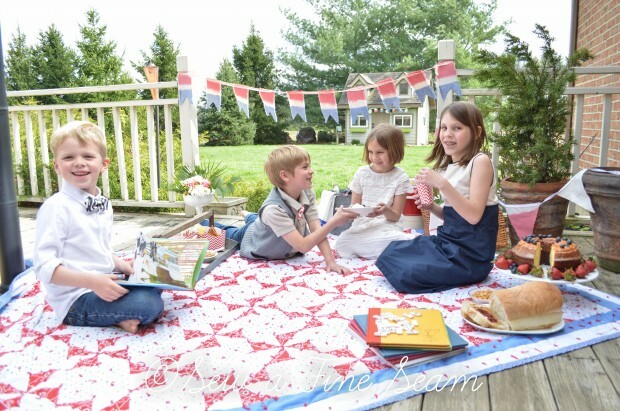 A picnic lunch for your kids is a fun way to use the banners – they will love it! I am really loving all this dipping of yours! 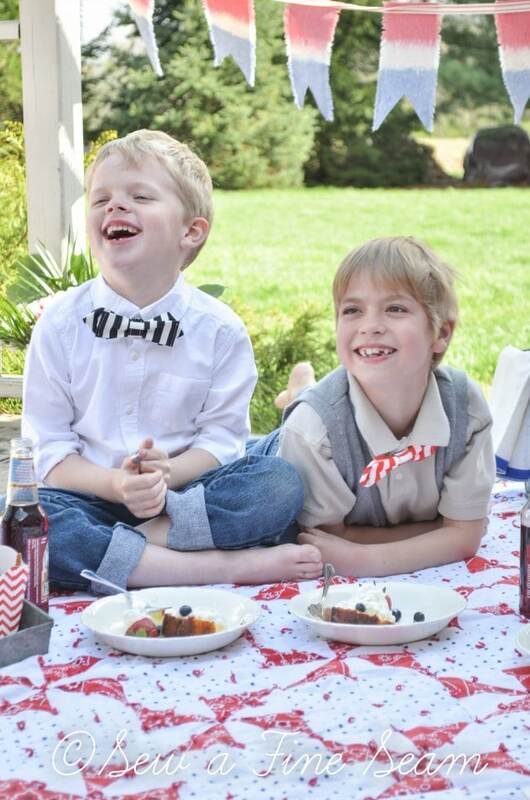 Wishing your beautiful family and your talented self a “BLESSED” Fourth of July! So cute! What a neat idea. I am going to make some for Fall for sure. You know I love me some dye! Felicia, you can easily make these in the evening too! Lots of light these long days! We stay-at-home Mom’s don’t have all the time in the world to get our blog posts up when everyone wants them either – especially when we also run small businesses! 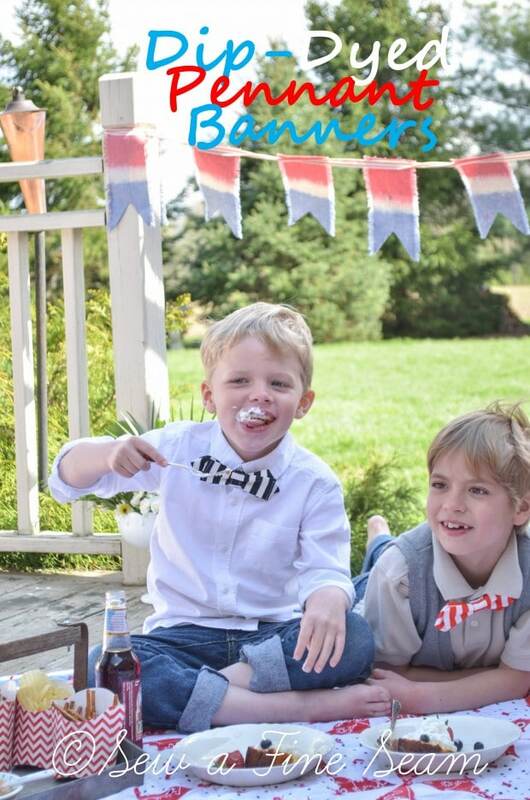 Have a happy 4th. What a fun project! Thanks for the great ideas and have a wonderful fun filled and safe holiday with your family! Some more awesome ideas! I am making these after work tomorrow! 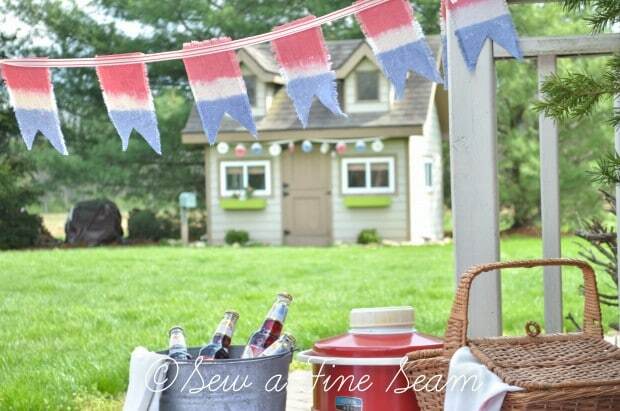 Such a quick project for any occasion and season! Thanks Jill! Thanks Carla! Have fun if you make your own! Awww, thanks so much my friend! You have a wonderful 4th too!